Get the crystal clarity, portability and data dexterity of a cellular phone — minus the minutes! With a Motorola DTR series digital two-way radio there are no flaky service tower signals, no monthly bills, no per-minute charges. Plus the DTR seers operates on the eXRS 900 Mhz band, which means there’s no FCC license required, so no fee! Communication on the job just got a whole lot cheaper! To stay on top, competitive companies need to keep costs down and customer satisfaction up. Cost effective on-site communication is key: whether you work in manufacturing, retail or a service industry; productivity means business. Motorola’s DTR series walkie-talkies increase job site coverage by 40%*. In real time, that means your employees transmit your business goals across 325,000 sq.ft. and up to 30 floors**. Motorola’s DTR series two-way radios do the legwork, so your employees can attend to the business at hand. The DTR digital difference also provides cell phone/radio hybrid features like One-to-One and One-to-Many calling. Digital One-to-One calling offers the convenience of a cell phone in that each radio has an 11-digit ID that allows one radio to ‘call’ another individual radio’s 11-digit ID. The Caller ID feature shows the ID of the radio that’s calling (or the radio’s name, if you use the optional mini-keyboard to program contact names). Call Forwarding lets you forward your calls to another radio’s ID. Digital One-to-Many calling is an old school radio transmission with a digital twist. One radio can transmit to your entire DTR series fleet. Or, depending on the model you choose, you can simultaneously communicate with between 15 and 25 customizable sub-groups (out of up to 25 programmable public groups in a potential 150 person shared/private contact list). So when Fred the Foreman needs to talk to John on the loading dock or when Jennifer the GM needs to meet with everyone from Maintenance, and only maintenance; productivity flows from just one call. The convenience of the Motorola DTR series data storage and transmission features lets you scroll through lists of your most frequently used ID’s and groups and your most recent calls. When discretion or a rush requires, you can send individuals or groups an SMS text message using preset options like “I’ll call you back in 5 minutes”. Or you can create, store and send your own messages using an optional mini-keyboard. Data cloning via cloning cable programs all of your radios with just the minimal effort of attaching the cable. With digital, it makes no difference if you’re on the fringe or the forefront of your walkie-talkie’s range. All of your communications come through loud and clear. They’re also private. Motorola DTR series two-way radios use a snoop-proof technology called the Frequency Hopping Spread Spectrum (FHSS). Co-invented by one of the great Hollywood beauties of the 1940’s actress Heddy Lamarr, FHSS was first patented during World War II as a countermeasure to protect radar, beacons, navigation and communications from enemy discovery. FHSS now boasts years of service in military communications for its low probability of intercept and anti-jam features. Low power usage and ability to share crowded bandwidth without producing interference pushed FHSS into commercial markets. FHSS protects your privacy by mixing your information with pseudo noise codes in a low power transmission over a bandwidth that is likely a 100 times wider than that needed for your information stream. Spreading signal across such a wide band renders the signal indistinguishable to wannabe listeners from other RF noise (Gaussian Noise, in technical terms). To further foil eavesdroppers, both your information and the pseudo noise codes hop from frequency to frequency. Except for about a 1 in 10 billion chance, only the designated receiver and transmitter know or can decode this sequence and reassemble your information. 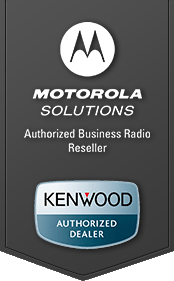 The odds are always in your favor when you use a Techwholesale.com offers two great models: Motorola DTR series radio to discuss confidential matters like the transfer of last night’s register or the arrival of a shipment or a VIP. Techwholesale.com offers two great models: DTR 410 and DTR 550. Both share the common attributes of the Motorola DTR series such as digital data, privacy and clarity meet military standards for durability and reliability (US Military Specficiations 810 C, D, E, F). Both operate for approximately 14.5 hours using the standard battery on the same 3-hour charge. Neither requires an FCC license. Their differences lie in range, price and a few user-friendly features. DTR 410, the lower priced model, may be programmed using Motorola’s free for download software that supports front panel programming. The DTR 410,may be monitored or disabled remotely and transmits and receives data and time updates over the air. It reaches members of its potential 100 unit (private/group) contact list over a range of 300,000 sq.ft. and up to 25 floors*. Up to 10 of its potential 25 public groups may scan the same channel at once. While the DTR 410, does offer private calling, it doesn’t support private groups. DTR 550 supports private calling, 10 private groups and 20 public groups in its 150 unit contact list. Up to 5 groups may scan a channel simultaneously. The DTR 550 may be monitored, disabled or receive date and time updates remotely, but does not initiate remote controlling. The DTR 550 carries a range of 325,000 sq. ft. and up to 30 floors*. Both models in Motorola’s Digital Two-Way Radio series offer a host of features and accessories to make your business run leaner, faster and smarter. Your employees will love the way they can wear their radios in sync with the way they work using a full range of diversely configured accessories like ear pieces with in-line mics, shoulder mics, clip-on mics; headsets and earbuds. Clip ‘em to a belt, holster ‘em cowboy style or just shove ‘em in a bag they’re always at the ready. Audio and vibration alerts for calls, alarms and reminders signal when there’s business at hand. Employees can charge them at their desks or managers can drop them all in a multi-unit charger that helps clone and keep track of each radio. You can’t beat the performance of the digital difference for the trifecta of privacy, clarity and performance. For a full listing of attributes, bells and whistles on the DTR 410 and DTR 550 and great prices with free shipping check out Techwholesale.com’s business radio offerings.